If you want to see a new Call of Duty: spirits multiplayer maps and two new forms of Maverick weapon, you need melody in the GameSpot Live Stream this Friday, January 31 at 12:30 PST clock. 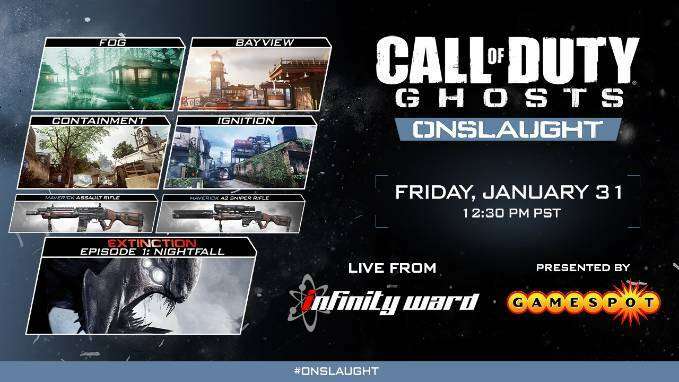 webcast of Infinity Ward, Gamespot will be prepared with Call of Duty developers to help you prepare for the next Double XP weekend. We will launch in the game by some multiplayer then we finish with you with the first in the history of the episode in four parts for the DLC, Episode 1: Nightfall. Stay on Gamespot Twitter and our Facebook page to listen and use the hashtag # rush to learn how to participate! Tagged Call Of Duty, Clock, Developers, Dlc, Duty, Episode 1, Friday, Game, Gamespot, Ghosts, Infinity Ward, Live Stream, Livestream, Maps, Mashup, Melody, Nightfall, Onslaught, Preview, Rush, Spirits, This, Twitter, Watch, Webcast, ‘Call.